A creeping plant, with small, round, leathery green leaves. 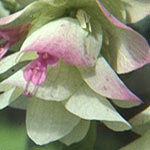 The drooping heads of rosy bracts are very ornamental. A nice choice for the rock garden, edgings, and dried flowers. Not for cooking.